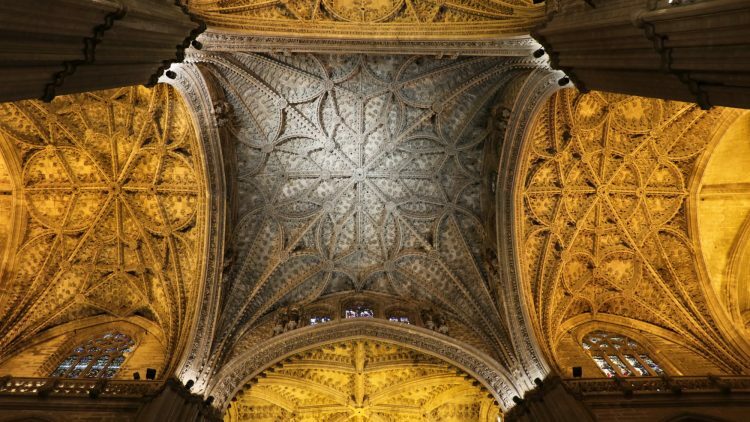 Seville Cathedral is one of the top sights to see in Andalusia – it is the largest Gothic church in the world and filled with wonderful art. Top tip: Buy tickets in advance. Seville Cathedral is one of the most popular attractions of Sevilla in Andalucia in the south of Spain. 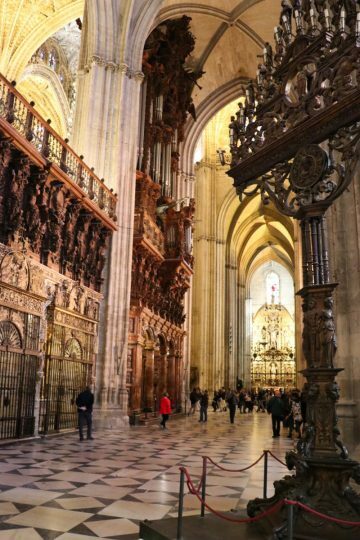 Not only is it the largest Gothic church in the world, it is also filled with art and architectural details that could be expected of a cathedral that was at the heart of world political and economic power for centuries. 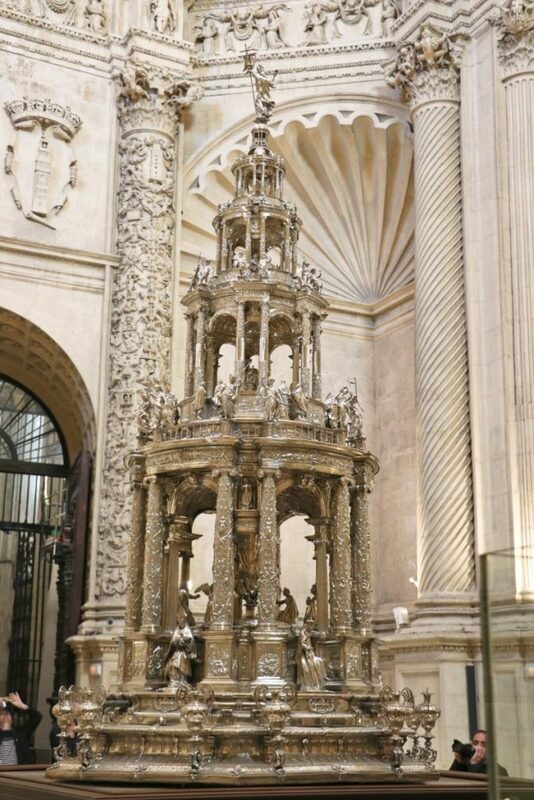 Although predominantly Gothic, Seville Cathedral also has strong Renaissance elements while some parts, including the minaret, survived from the original Moorish mosque. As for the nearby equally popular Real Alcazar, buy skip-the-line time-slot reservation tickets online in advance or book guided tours. 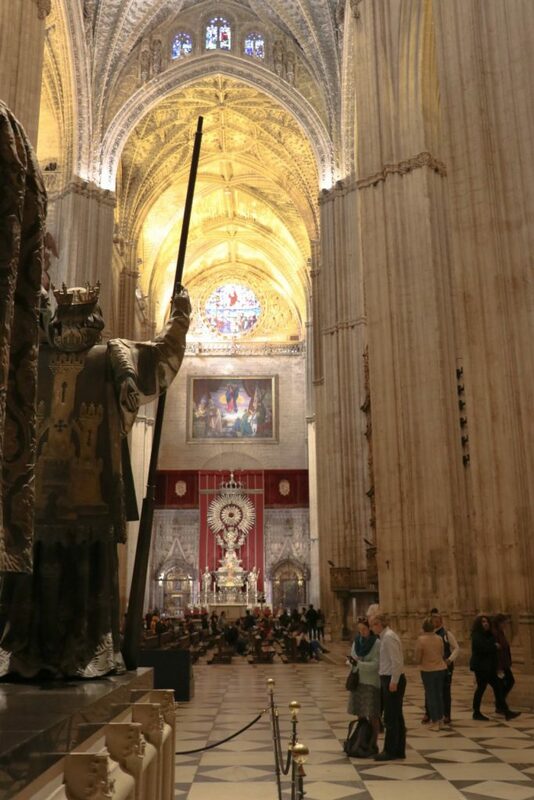 The magnificent Seville Cathedral is the largest Gothic church in the world and third largest church overall in Europe after St Peter’s in the Vatican and St Paul’s in London. The official name is La catedral metropolitana de Santa María de la Sede (Cathedral of Saint Mary of the See). In contrast to the larger churches, it is actually a bishop’s seat and thus has been the largest cathedral in the world for more than 500 years. 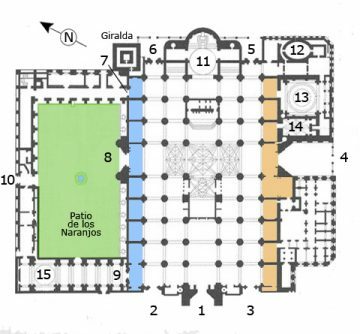 The basic layout of Seville Cathedral is a large rectangle with five aisles and a non-protruding transept. The inside measurements of the Gothic cathedral are 126 m in length, 83 m in width and a height of 37 m in the transept and central nave. The total area of the building is 23,500 square meters. The choir and high altar form an intimate chancel enclosure at the center where high mass is said daily. Chapels line the sides while the vestries and chapter house are masterpieces of the Renaissance. The base of the Moorish Giralda belfry that towers over the church and city is the oldest part of the building. It even uses recycled Roman stones. Following the conquest of Islamic Seville in the mid-13th century by the Roman Catholic King Ferdinand III of Castile, the typical reaction was to convert the exiting mosque into a Christian church. The Orange Tree Courtyard and the lower section of the Giralda bell tower survived from the Moorish mosque constructed during the late 12th century but the rest of the structure was gradually replaced by a purpose-built church. The main Late Gothic church was constructed between 1434 and 1517. Renaissance additions were completed between 1528 and 1621 and include the Royal Chapel, vestries and the upper parts of the bell tower. 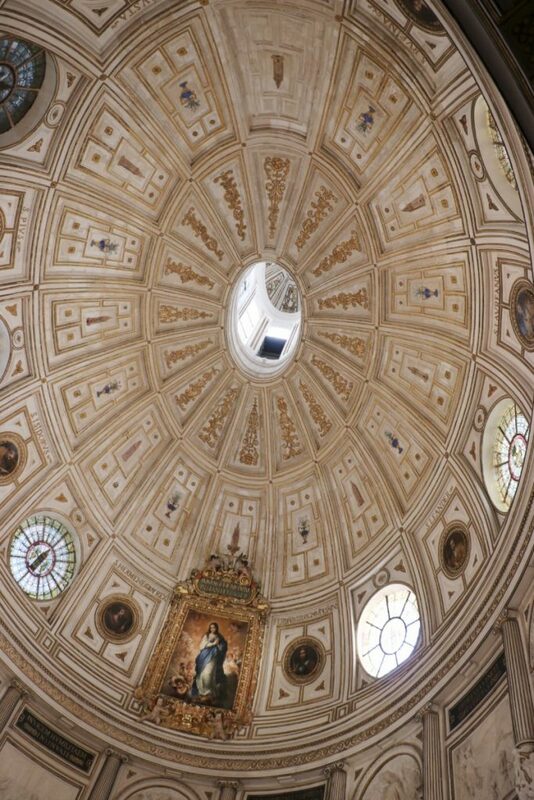 Renaissance start architect Hernan Ruiz Jimenez, who also designed much of the cathedral inside the Mezquita in Cordoba, was involved and characteristically completed the work to a very high artistic standard. The church also has some Baroque elements while the final major elements of the church were completed in the early 20th century with the installation of the three major Neo Gothic porticos. These include the current main visitors entrance that is visibly newer than the main church, although the whiter appearance is more the result of using a different kind of stone rather than an age difference with the rest of the church. 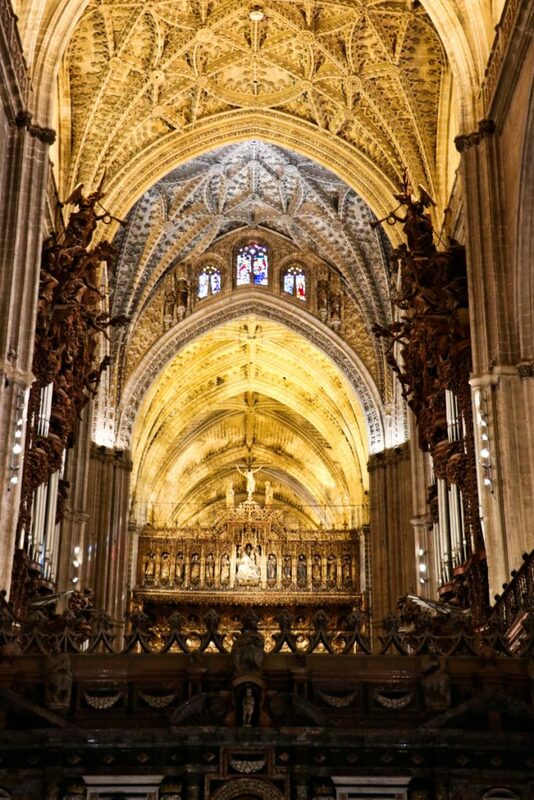 Seville Cathedral, together with the Real Alcazar, was inscribed on the UNESCO World Cultural Heritage list in 1987. 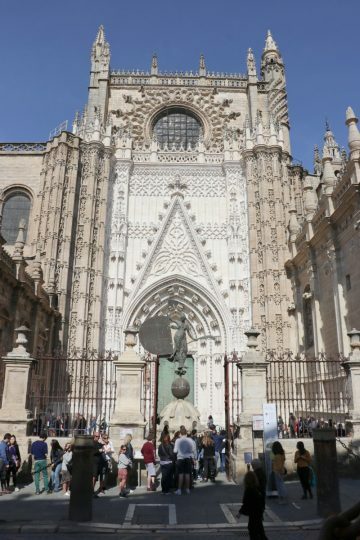 The main entrance to Seville Cathedral for cultural or tourist visits is via the Puerte de San Cristobal on the south of the building on the Plaza de Triunfo opposite from the Real Alcazar. A full-scale copy of the Giraldillo weather vane statue that tops the bell tower is seen here. Visitors pass through a small exhibition area that contains works by amongst others Murillo and Zurbaran but the best art is in the chapels, vestries and treasury. As the side aisles are mostly empty, the first impression upon entering the cathedral is a sense of immense space. The church is visually long and wide with the slender pillars emphasizing the height of the flamboyant vaulting. Much of the vaulting is fairly unadorned and simple with the noticeable exception of the central parts of the nave and transept that are highlighted by plateresque tracery. The church is relatively dark inside as the stained glass windows are fairly small and high up. Many of the church windows are originals from the Gothic and Renaissance periods. The mid-16th century rose window of the four evangelists measures 9 m in diameter. 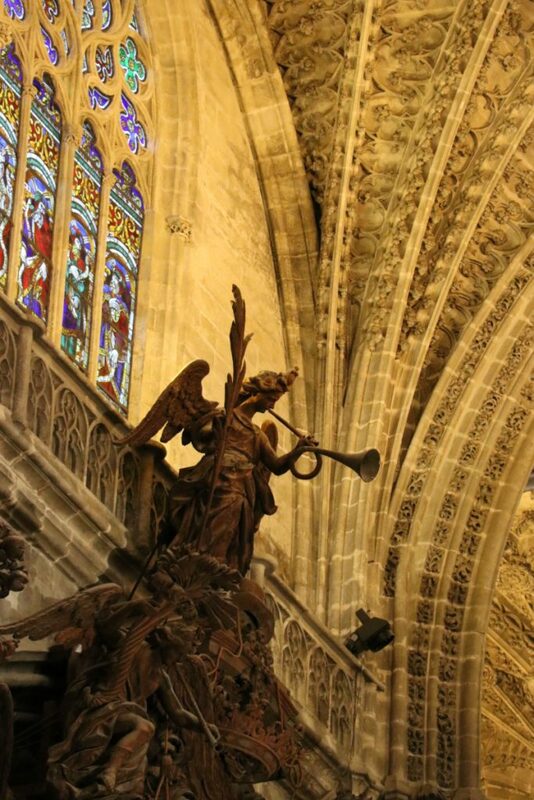 In the centre of the church is the choir and high altar — in contrast to most other European countries, churches in Spain often enclose the centre of the church with a coro (choir) for a more intimate area for services. The daily 10:00 mass is still held here in the Capilla Mayor – a good time to hear the organ play (but no sightseeing or photos). 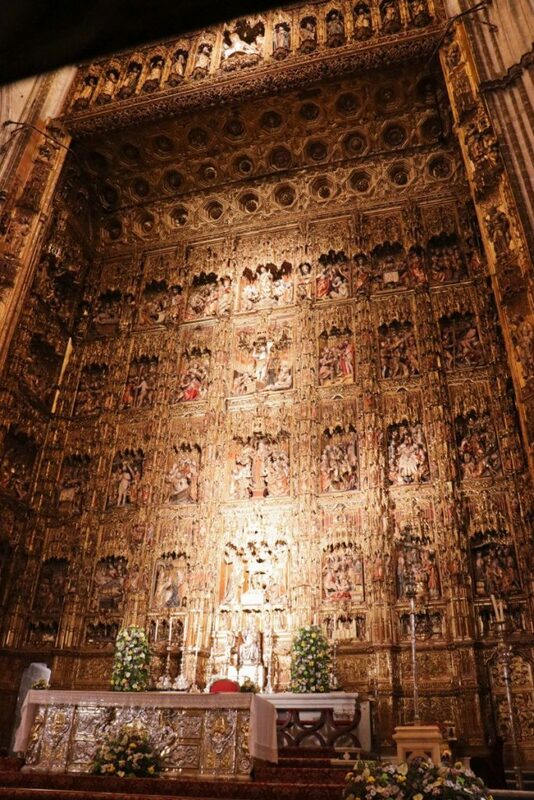 The High Altar (Altar Mayor) is not only the largest but probably also the most impressive work of art in Seville Cathedral. It has a large space to fill — the vaulting of the central nave reaches 37 m into the sky. 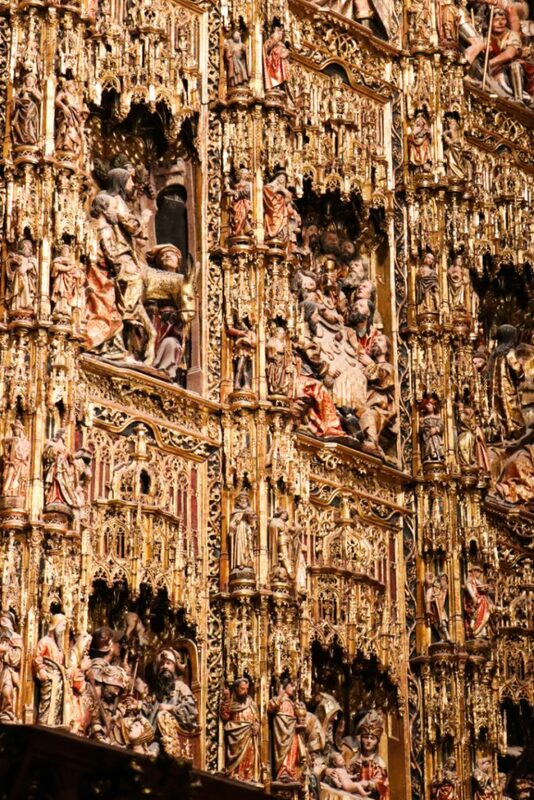 The wood-carved altarpiece measures 20 m high and 23 m wide — the largest Gothic altar in the world. This size required the higher up sculptures to be larger to preserve perspective when viewed from below. 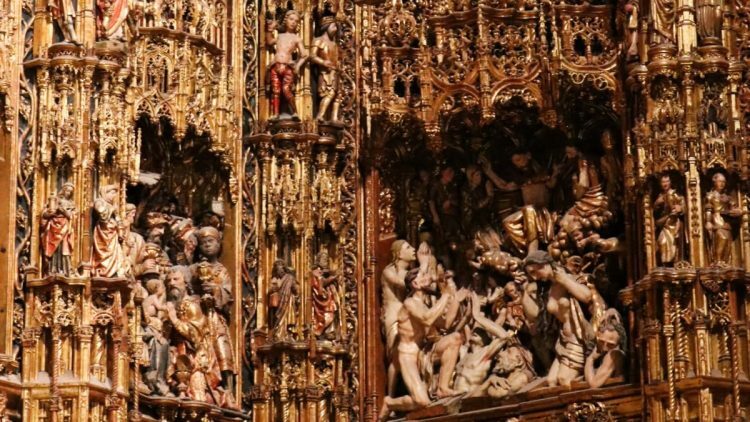 The basic design was made by the Flemish artist Pieter Dancart in 1482 but the actual carving of the 45 panels took nearly 80 years to complete. 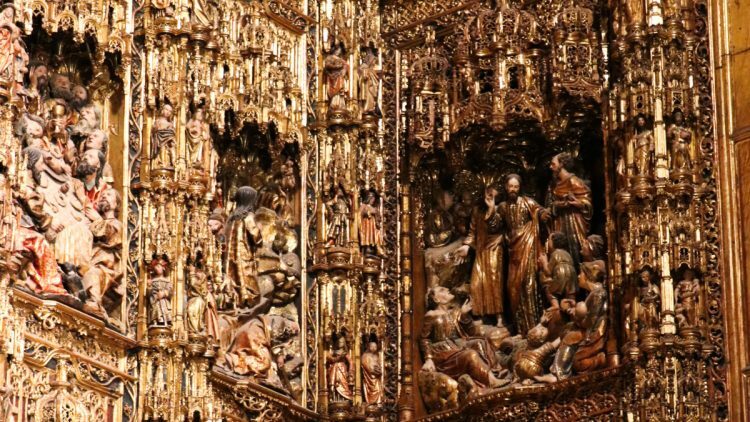 Three tons of gold were used in the decoration of the altar. The altar mostly illustrates scenes from the live of Jesus Christ and Maria but also features depictions of the apostles. As the cathedral is dedicated to Maria, she rather than Christ is at times placed at the center and some scenes are not in the standard version of the bible. The story is chronological mostly from the bottom to the top, although the Final Judgement for example is bottom right. Many panels are fairly easy to follow for anyone with basic knowledge of biblical events. The Choir (Chancel) is equally impressive. 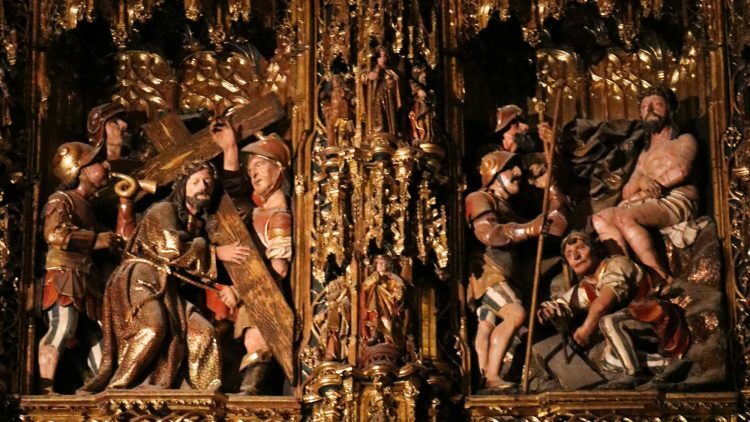 Much of the woodwork is 15th century by Luis Gonzalez. Circle round the back to see the 17th-century retrochoir by Luis Gonzalez. The two organs are in an 18th-century box by Duque Cornejo. They have around 7,000 pipes and are played from a central four manual control. 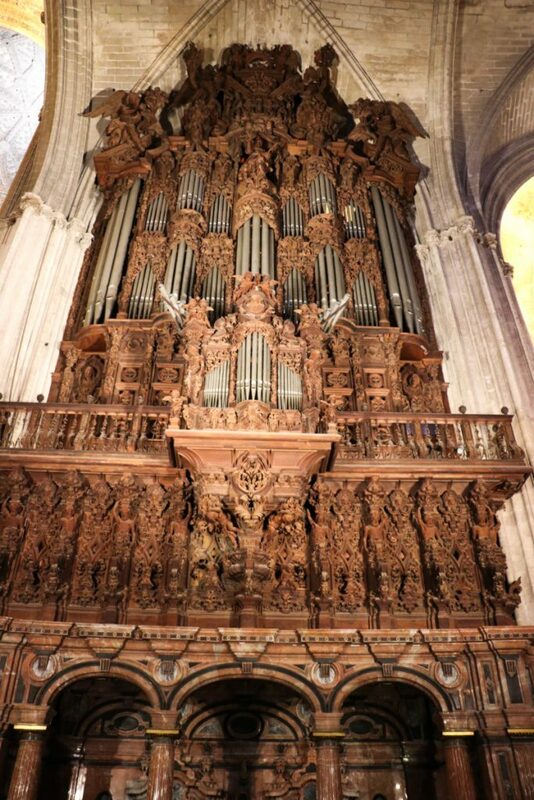 The original baroque organ did not survive the earthquake of 1888 and the present organ is from the early 1900s but updated in 1996 by adding amongst others some traditional baroque sound options. 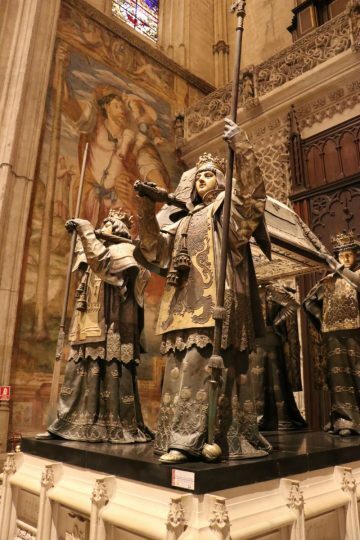 Seville cathedral is filled with art including numerous statues, tombs and paintings. The side chapels have some fine works but the best items are in the vestries, chapter house and treasury. 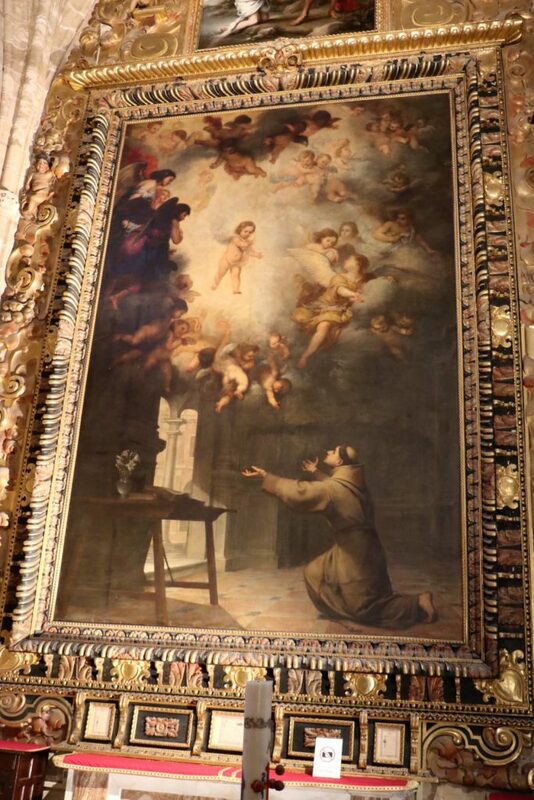 The church has several paintings by local Baroque artist Bartolomé Esteban Murillo including the Guardian Angel (Altar del Nacimiento), The Vision of St Anthony (Capilla de San Antonio), and the Immaculate Conception high up in the ceiling of the Chapter House. 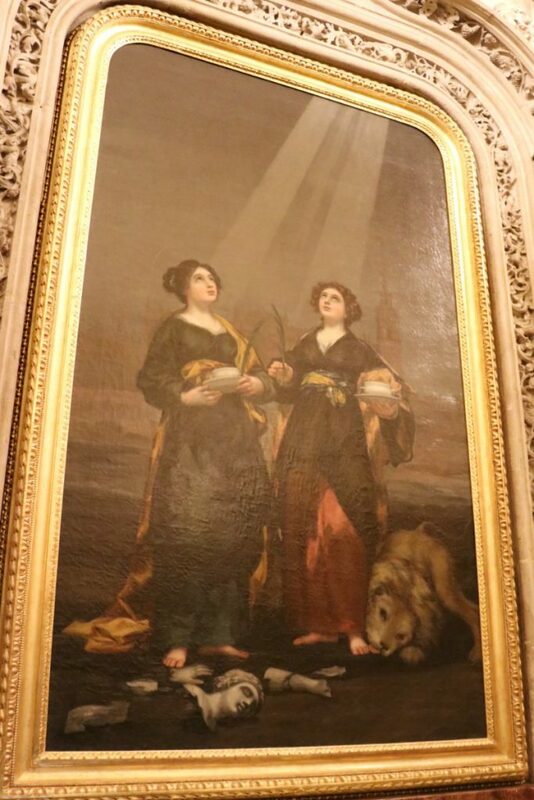 The painting of local martyrs Saints Justa and Rufina by Francisco de Goya was specifically painted for its position in the Vestry of the Chalices. Francisco de Zurbaran did several paintings for the chapel of St Peter. 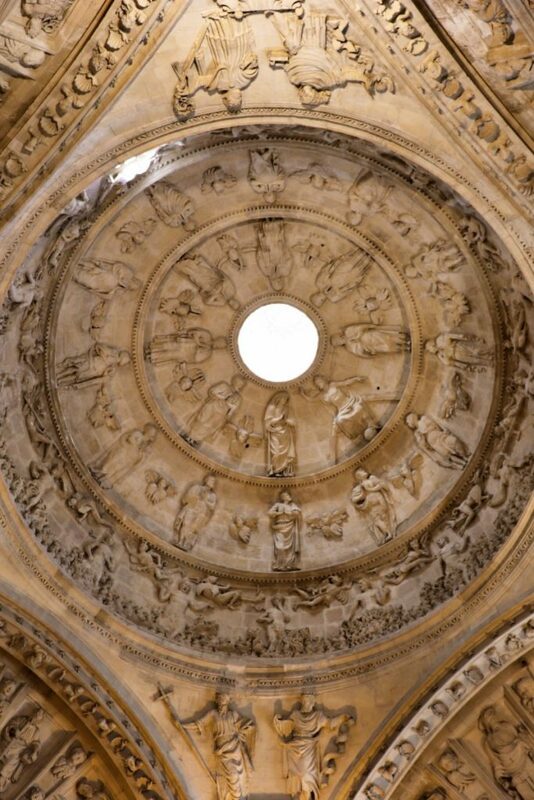 The elliptical 16th-century cupola of the Chapter House by Hernan Ruiz is an absolute highlight of the Renaissance. It is enhanced by an Immaculate Conception painting by Murillo. The treasury has the typical Roman Catholic cathedral paraphernalia and vestments. Several items are of exquisite quality. Some of the highlights combine both artistic quality and extraordinary size such as the Renaissance silver monstrance by Juan Arfe — it is 3.9 m tall and weighs 475 kg, including 350 kg of silver. 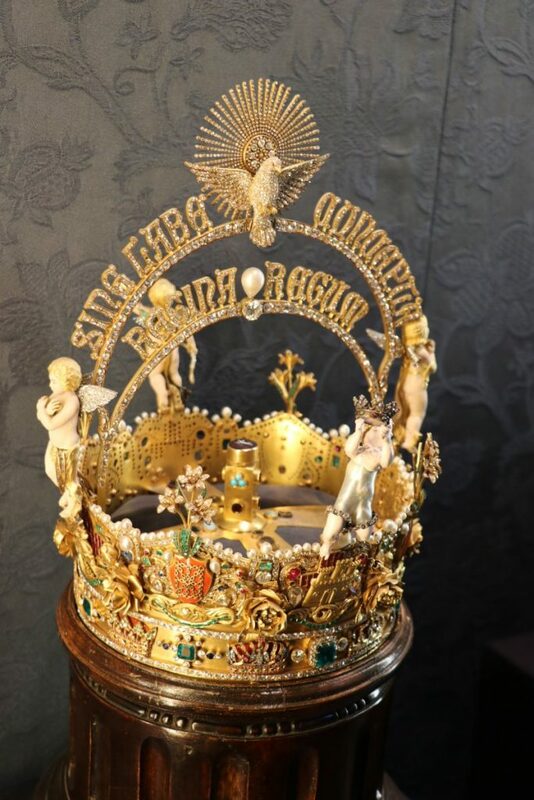 The most praised in the collection of crowns was only made in 1904. 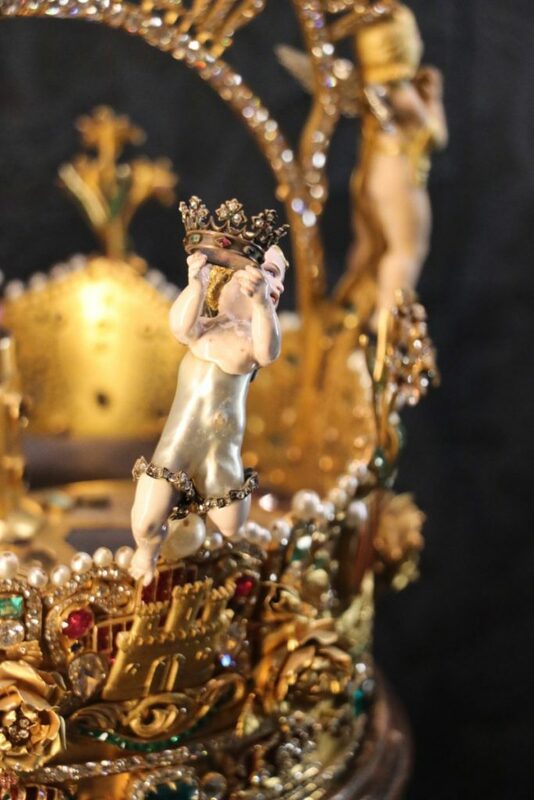 In the exquisite crown of the Virgin of the Kings, note the body of the cherub made from what is claimed to be the largest single pearl in the world. 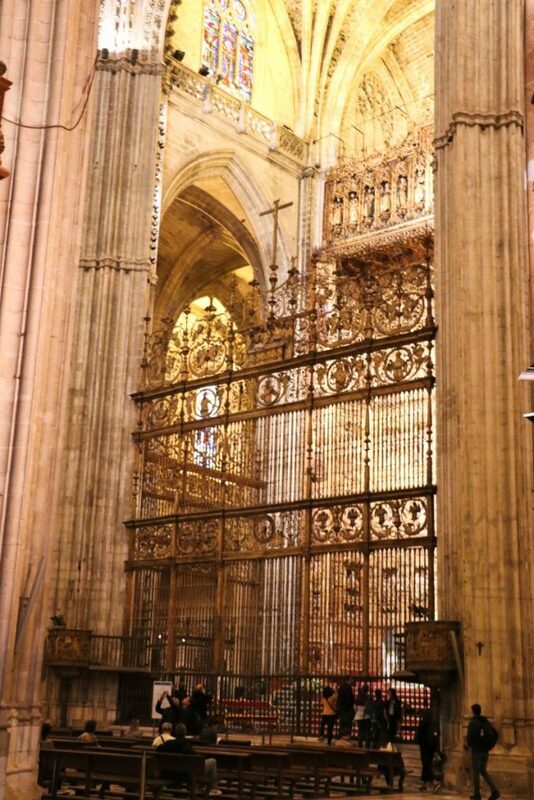 The Royal Chapel (Capilla Real) at the front of the church may only be entered during services — usually early morning and after regular closing hours at night — but the art may still be admired through the 18th-century grills. Much of this chapel was completed during the reign of Charles V. It contains the remains of King Ferdinand III – principal actor in the reconquest of the 13th century. He was canonized in 1671 and is the patron saint of amongst others Seville. More interesting, his tomb is inscribed in four languages: Arabic, Hebrew, Latin and Castilian – like the nearby Mudejar Real Alcazar a confirmation that the religious importance of the conquests came only years after the event. 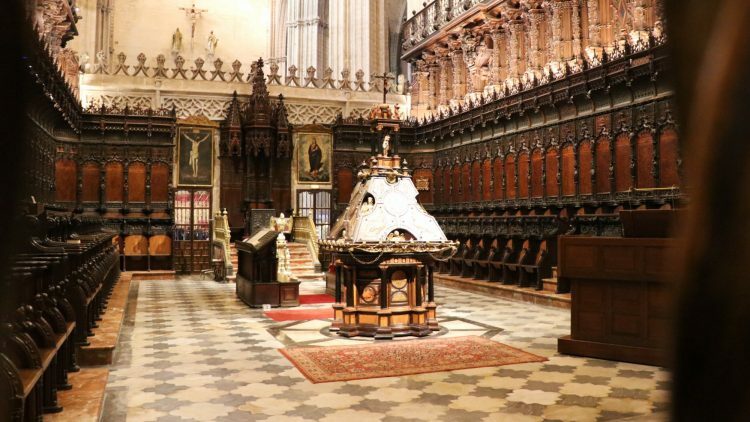 The cathedral has several tombs but none more famous, or ostentatious, than the 19th-century final resting place of the remains of Christopher Columbus (1451-1506, Cristobal Colon in Spanish). 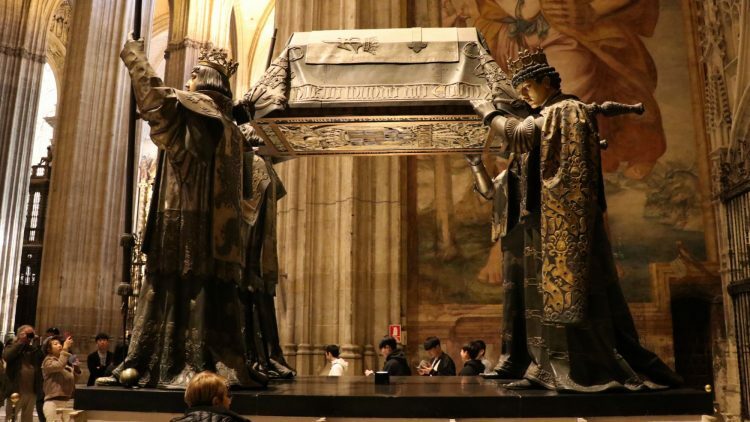 His coffin is carried by life-size pall-bearing statues representing the kingdoms of Castile, Leon, Aragon and Navarre. The prince of Leon spears a pomegranate — the symbol of Granada, the last Islamic city in Iberia conquered by Ferdinand II of Aragon and Isabella I of Castile in 1492 around the time of Columbus’s discovery of the Americas. Trade with the New World guaranteed the wealth of Seville for centuries and Columbus remained a local hero. He died in 1506 and was subsequently buried in Valladolid, then moved to Seville in 1509. In 1537, his remains were moved to Santa Domingo, as he originally requested, but in 1778 the Spanish moved his bones to Cuba. Following independence, the Cubans send his bones back to Seville in 1898. Recent research almost guaranteed that the bones in the coffin are indeed those of Columbus but they constitute less than a fifth of a human skeleton. Where the rest of Colon is, is unknown / disputed / debatable. The large painting of St Christopher carrying Christ on the wall behind the tomb confirmed that this entrance door to the church — the Door of St Christopher — is named after the patron saint of travelers, not after the great explorer. At the rear of the church, under the floor, is the grave of Hernando Colon (1488-1539) — son of Christopher. 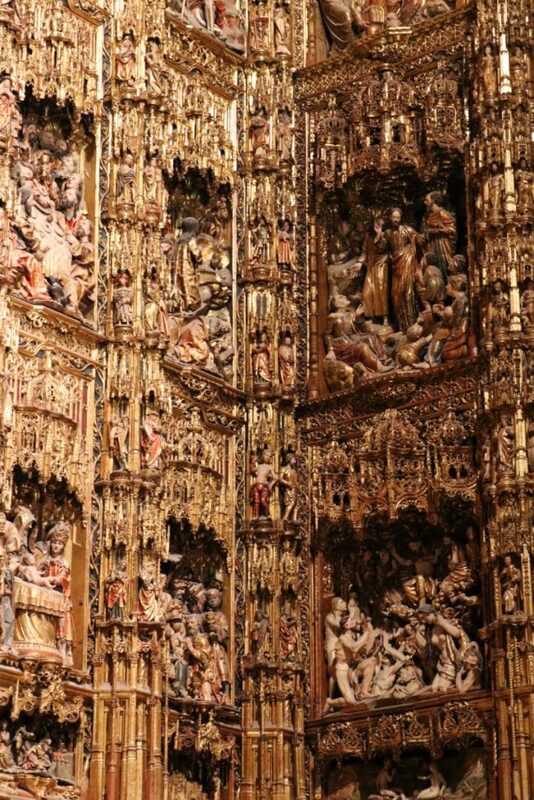 He donated his library of around 6,000 works to the church. 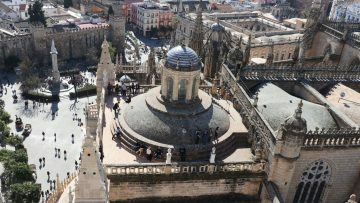 The spectacular Giralda Tower is the bell tower of Seville Cathedral and the symbol of the city, It is just shy of 100 m and topped off by a large statue of faith victorious that serves as a weather vane. The Giralda Tower was originally the minaret of the mosque but became the church tower after the conquest. The Renaissance bell tower was added to the top of the minaret by star architect Hernan Ruiz between 1558 and 1568. The tower thus contains elements from the Islamic as well as Christian periods. Some parts are even older — some of the larger stones near the foot of the tower were recycled from Roman buildings — latin inscriptions may still be read on the exterior wall. 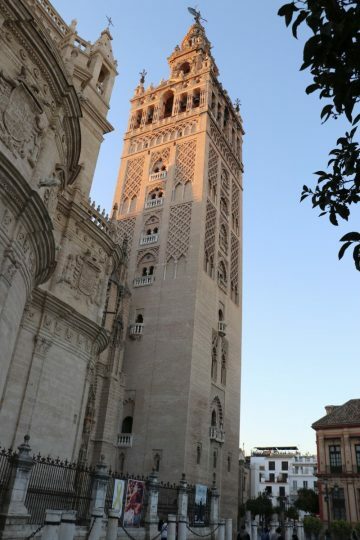 The Giralda Tower is easily scaled, as visitors walk up 35 ramps with only a short flight of stairs right at the top. The entrance is from the front of the church near the Royal Chapel and included in all cathedral admission tickets. It can become a bit of a press gang at busy times — try to be there early or late, but not too late: it is the first part of the cathedral closed late afternoon. The Giralda Tower is 94.69 m high plus a further 7.69 m for the Giraldillo statue symbolizing faith victorious. A full size copy of this weather vane may be seen outside the main entrance to the church. 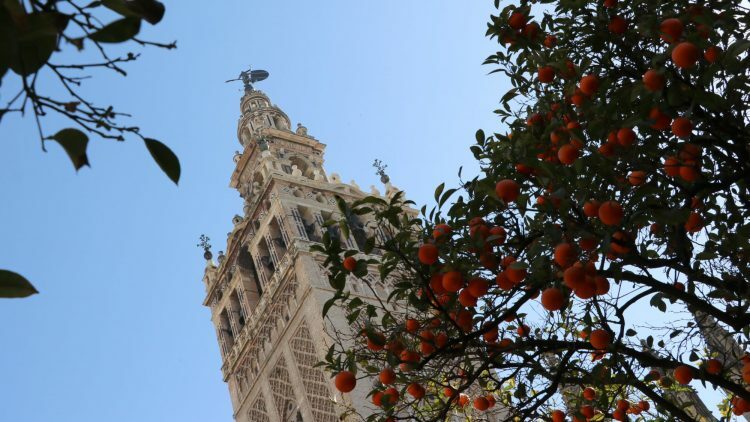 Measurements of the height of the Giralda tower are surprisingly unclear — claims in various guidebooks seem to range from 88 m plus statue to 104 m all-in. The cathedral goes with 96 m “from the ground to the weather vane”. The exit from Seville Cathedral is via the pleasant orange tree courtyard (patio de los naranjos) that served as the ablution area of the mosque. The main Neo-Gothic entrance to the cathedral from here — the Door of the Conception — is only used during major festivals. The Door of Forgiveness (Puerta del Perdon) leads from the courtyard to the street. The wooden doors were part of the original mosque but the horseshoe arch and other decorations are Mudejar from the Christian era. 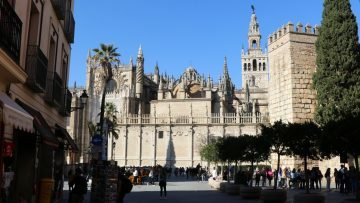 Although Seville Cathedral is open for religious services from around 8:00 to 20:00, hours for tourists (or cultural visits) are far shorter. 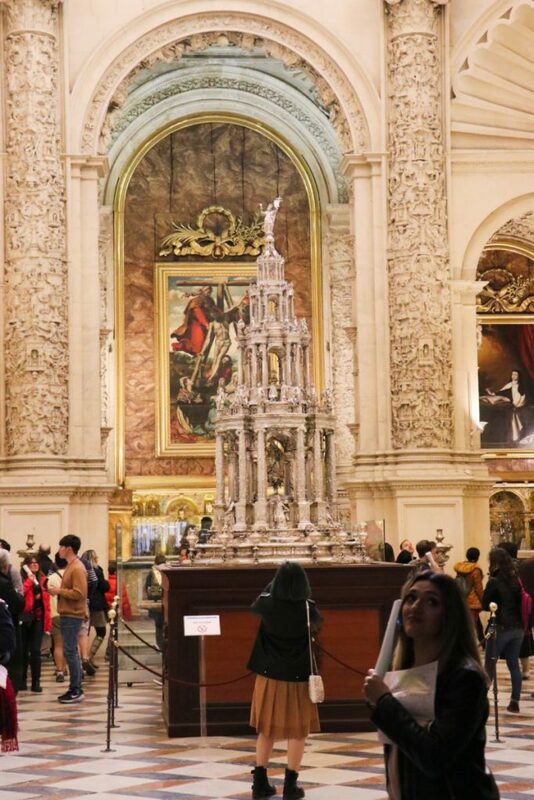 The best times to visit Seville Cathedral is usually in the later afternoon but don’t visit too late as the Giralda and some of the outer rooms are evacuated from around half an hour before closing time. Due to the relatively late opening time, the independent traveler’s mantra of visiting first thing in the morning is less successful here than say at the Real Alcazar or the Mezquita in Cordoba. The church is usually busiest around noon. Admission is free on Monday afternoons from 16:30 to 18:00 for 70 visitors — online reservations are essential and fairly hard to obtain. The system jumps around a bit — at times tickets are available (and taken up) two months in advance while at others the online applications only open on the preceding Friday. Buy tickets in advance online, or book guided tours, or buy tickets from the nearby Church of the Divine Saviour. 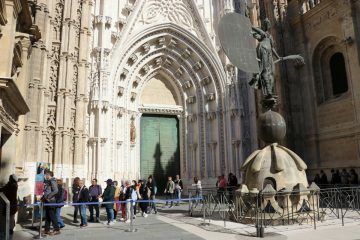 See Buying the Cheapest Skip-the-Line Tickets and Tours for Seville Cathedral for details and suggestions. 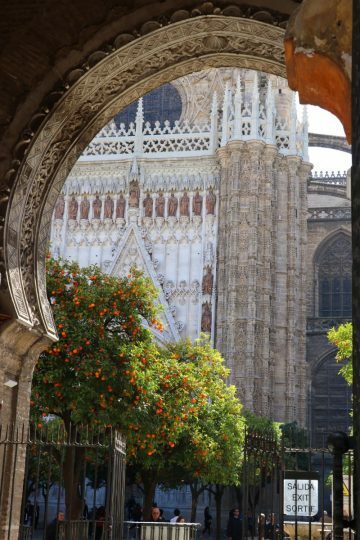 The entrance to Seville cathedral for individuals are on the south side of the church off the Plaza del Triunfo with the exit via the Orange Tree Courtyard to the north. Admission for religious services are via smaller doors at the front and rear of the church. Groups often use a separate entrance near the Giralda tower. Some tours use the San Miguel Gate on Avenida de la Constitucion.